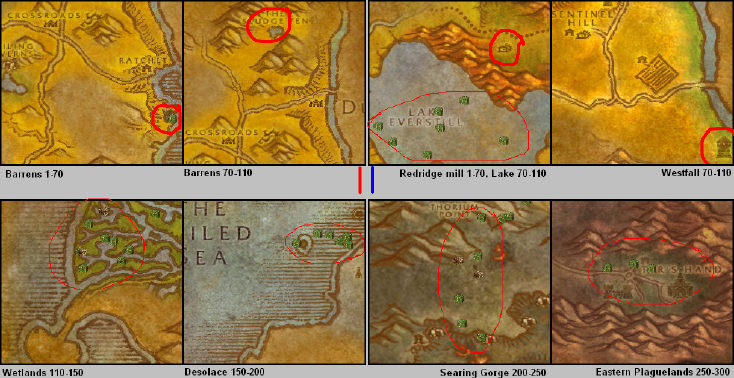 Ashenvale, The Zoram Strand 70-110: Respawn timers are non-existant. 1 Box Spawn. Stonetalon Mountains, Windshear Crag 70-110: Respawn timers are non-existant. 4 Box spawns. Stonetalon Mountains, Windshear Mine 110-150: Respawn timers are non-existant. 5 Box spawns. Wetlands, Outside of Murloc Camps 70-110: Respawn timers are non-existant. 3 Box spawns. Desolace, Sar'theris Strand (North) 175-225: 3 Minute respawn timer. 2 Box spawns. Badlands, Angor's Fortress (Upper tier) 150-200 Respawn timers are non-existant. 3 Box spawns. Badlands, Angor's Fortress (Lower tier) 175-225 Respawn timers are non-existant. 3 Box spawns. Gnomergan Back Door. 150-200. Does not give more than 1 skill up, per server reset. Searing Gorge, The Slag Pit (Upper, hostile area). 225-275 Respawn timers are non-existant. 4 Box spawns. Stratholme Gates (inside instance) 300-??? (assuming this is viable to reset grind) 2 spawns? Last edited by vytiokas on Wed Aug 19, 2015 2:29 pm, edited 3 times in total. Looks like a tbcguide, some numbers are incorrect. Fe. U can skill up to 90 at the Mill in redridge. i will update this because i'm leveling Lockpicking via this guide , actually its not how much you can but how much is better. Topic updates , any news will be updated . Thought I would post an update here since the OP is a bit off on the numbers for some zones. In all of these areas the chests/footlockers respawn very quickly. At level 60, 1-300 LP can be done using these zones in less than two hours. Click your lockpicking icron and then hover over the chest to open it. I'm not sure if it's a bug or working as intended but I was able to level lockpicking to 95 at the mill in Redridge.